With this week's Rewarding Times, we have extended last week's offer, to give you another opportunity to purchase and enjoy a fabulous three night holiday in the 4* Hotel Westport, situated down The Demesne in the heart of Westport Town in County Mayo. 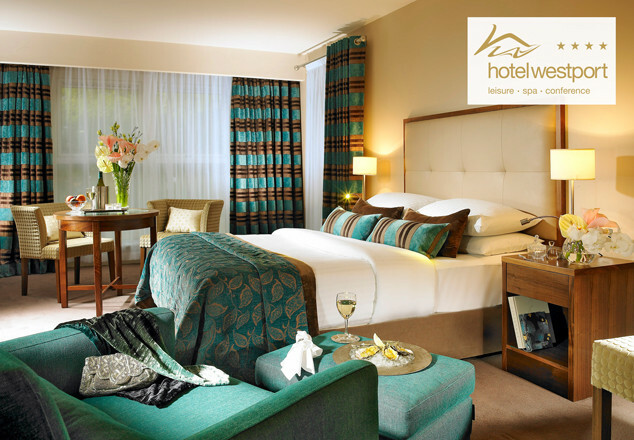 This Offer is an amazing €238 in Total for Two with a complimentary upgrade to a Premier Room. The offer includes breakfast each morning served until a leisurely 11am, dinner on one evening of your choice in the Islands Restaurant plus complimentary use of the award-winning leisure facilities, plus the Irish Times delivered to your door! The 4* Hotel Westport is nestled in 7 acres of mature woodland with private patio and river gardens. It is the ideal location to explore Westport, Mayo and the Wild Atlantic Way. The Islands Restaurant offers AA Rosette Dining while there is more casual dining in the Maple Bar. The Chefs in Hotel Westport use the best of local, regional and in season ingredients and suppliers. Hotel Westport offers a mix of traditional charm and understated elegance. Hospitality and Service are the backbone of Hotel Westport and this has been duly noted over the years with a flurry of awards including the AA Courtesy & Care Award, Hotel Bar of the Year Award, and an AA Rosette for Culinary excellence. Take a break at 'one of Ireland's best loved hotels'.